Government in the reference read above, has issued oertain guidelines for conSideration of absorption in respect of the qualified un aided staff who were appomted against the sanctioned posts and as per the recruitment procedure, and whose appomtments were approved by the competent authorities in the respective posts duly following the seniority, qualification etc., in accordance with law. However, these orders were subsequently cancelled. 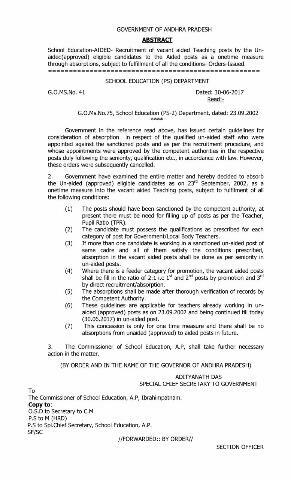 (1) The posts should have been sanctioned by the competent authority, at present there must be need for filling up of posts as per the Teacher, Pupil Ratio (TPR). (2) The candidate must possess the qualifications as prescribed for each category of post for Government/Local Body Teachers. (3) If more than one candidate is working in a sanctioned un-aided post of same cadre and all of them satisfy the conditions prescribed, absorption in the vacant aided posts shall be done as per seniority in un-aided posts. (4) Where there is a feeder category for promotion, the vacant aided posts shall be fill in the ratio of 2:1 i.e 1‘t and 2'“1 posts by promotion and 3"1 by direct recrUitment/absorption. (S) The absorptions shall be made after thorough verification of records by the Competent Authority. (30.06.2017) in un aided post. (7) This concession is only for one time measure and there shall be no absorptions from unaided (approved) to aided posts in future. 3. The Commissioner of School Education, A.P, shall take further necessary action in the matter.